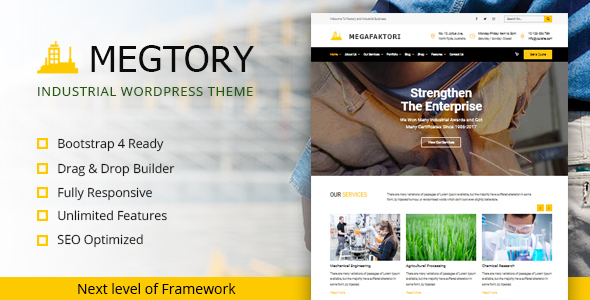 Megtory is a professional WordPress theme built for manufacture, industry, factory, laboratory, Commodity Business, Power, Rail Business, Airplane, Ship Business, Oil & Gas Business, Petroleum or construction company. We included Visual Composer, Revolution slider, WooCommerce support and advanced admin panel. You can set unlimited colors and create unlimited layouts.